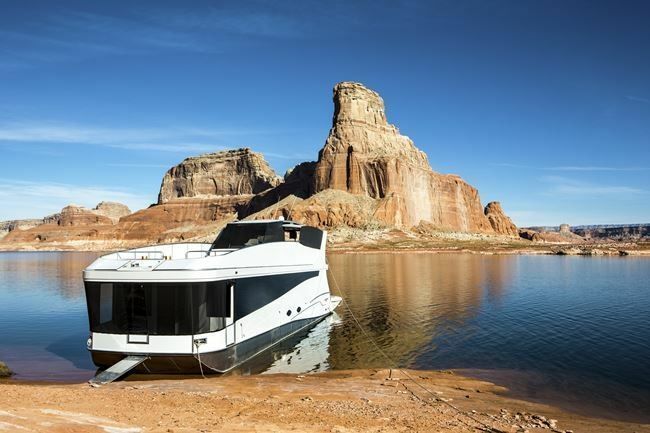 Houseboating on Lake Powell, previously a winner of “FTF’s Top 10 Getaways for Family Reunions” Award, gets a fresh look as a vacation option in 2018. Lake Powell is at the heart of Glen Canyon National Recreation Area, a 1.25 million-acre geologic playground straddling northern Arizona and southern Utah. The 186-mile-long, manmade lake boasts 2,000 miles of soaring red sandstone cliffs, 90 major canyons and sandy beaches, and is astonishingly beautiful in its desert setting. Houseboating is the best way for family groups to explore it, while unwinding amid the comforts of home. Our only caveat: water levels. The lake is recovering now from nearly a decade of drought but in the dry years, many of the most beautiful canyons become impassible (except by foot) and some once-accessible areas can turn into thick mud. Typically, Lake Powell’s amazingly clear blue-green water is everywhere and it is so enticing. In order to best explore the canyons and guarantee fun, houseboat renters generally tow a powerboat so that they can enjoy waterskiing and fishing, and carry water toys, including personal watercraft, wakeboards, kneeboards, sprayers and water trampolines. Children under the age of 12 are required to wear life jackets at all times on powerboats, water toys, and on the exterior of the houseboat. Never been a pilot? A thorough orientation and training session is given to the boat’s captain who must be at least 18-years-old and have a valid US driver’s license or passport. Additionally, all sailors will receive written information about docking, anchoring, refueling and other naval issues in the form of an instruction manual. 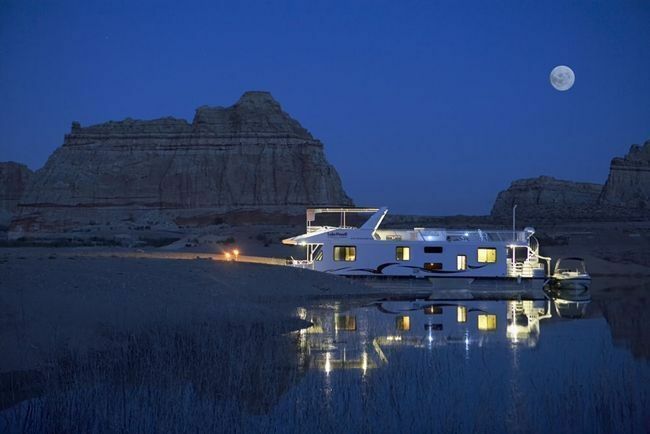 Lake Powell Resorts & Marinas, managed by Aramark, is a concessionaire of the National Park Service that operates two full-service marinas offering houseboat and powerboat rentals, on the north and southwestern sides of the lake. Marinas sell provisions such as food, beverages, ice, film and fuel, and their staff provides “How-To” lessons, maps (important! ), gear, rest rooms, phones and laundry facilities. All houseboats, like the basic 46’ Expedition (sleeping 6), provide a propane range, oven, refrigerator, water heater and space heater, outdoor gas grill, electric light system, bathroom and shower, dishes, utensils and a swim slide. Extras on the new luxury class boats like the 75’ Odyssey (sleeping 16) include six staterooms with queen beds, two pullout double sofabeds, hot tubs, fireplaces and home theatre systems, rivaling those of a four-star hotel. Note that not all boats are available at each marina. Rates for standard to luxury boats straddle a large range according to size and travel dates, so relatives on most every budget can afford one. It’s also a fun idea to have your collective families add their floating home to a reunion convoy. Houseboating packages including lodging, powerboat and watertoys are available. Additionally, the company runs three nearby RV and campgrounds. 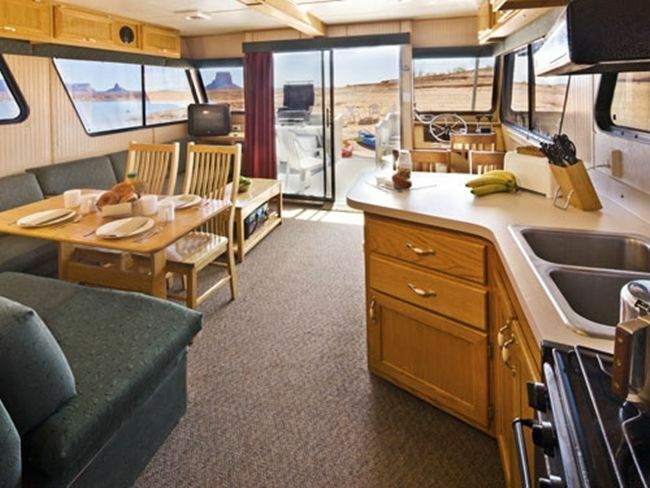 The Antelope Point Marina, located near Page, Arizona is another option for Lake Powell houseboat rentals and services. Antelope Point was built in conjunction with the National Park Service and the Navajo Nation, and provides similar services while highlighting the Native American culture of the area.